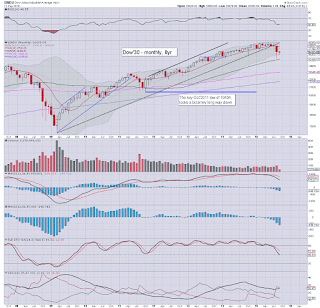 Despite battling upward from a double floor of sp'1867, the US equity indexes remain broken, as especially seen on the giant monthly cycles. 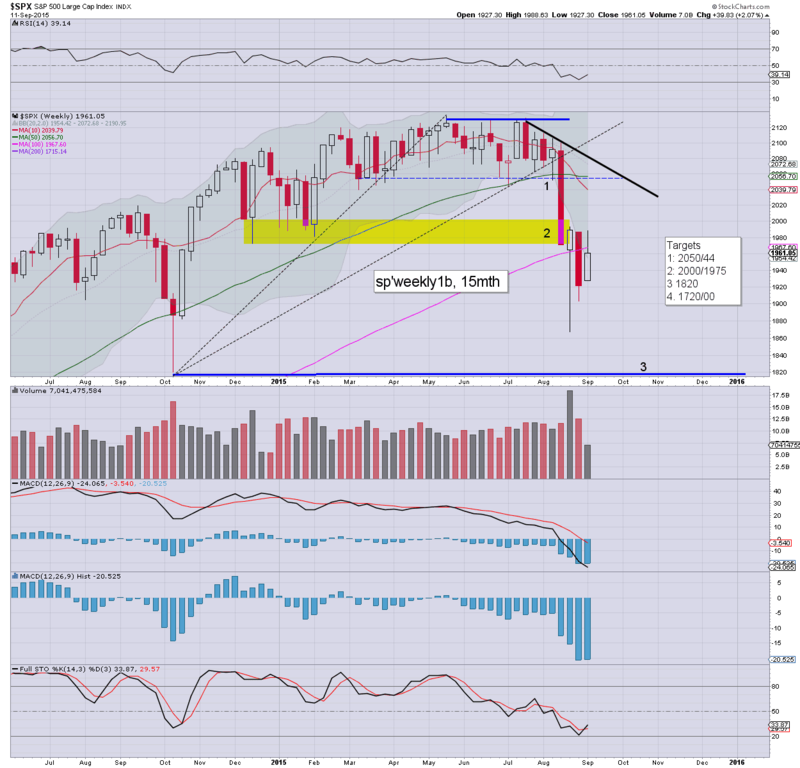 We have clear breaks across all indexes, with new lows due in October. It is currently a case of treating all bounces as just that... bounces. 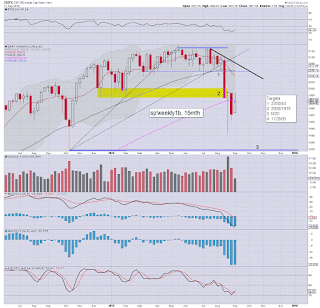 The sp'500 is now 94pts above the Aug'24/25th double floor of 1867, an impressive initial bounce of almost 5%. Yet.. the technical damage done in August was severe. First key resistance is the 10MA, currently @ 2051. 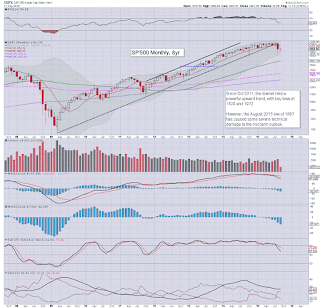 Until the market can attain a monthly close back above the 10MA, the bears remain in FULL control. Underlying MACD (blue bar histogram) cycle continues to tick lower, and has now been negative for 7 consecutive months. With each month, price momentum increasingly swings in favour of the equity bears. In terms of downside, the lower monthly bol' will be around 1850/60 in Oct' and that would be a natural target. 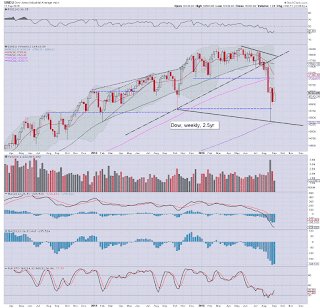 From there, the Oct'2014 low of 1820. Core trend support - linking the 2009/2011 lows is around 1725. I do not expect sustained action <1700 this year. 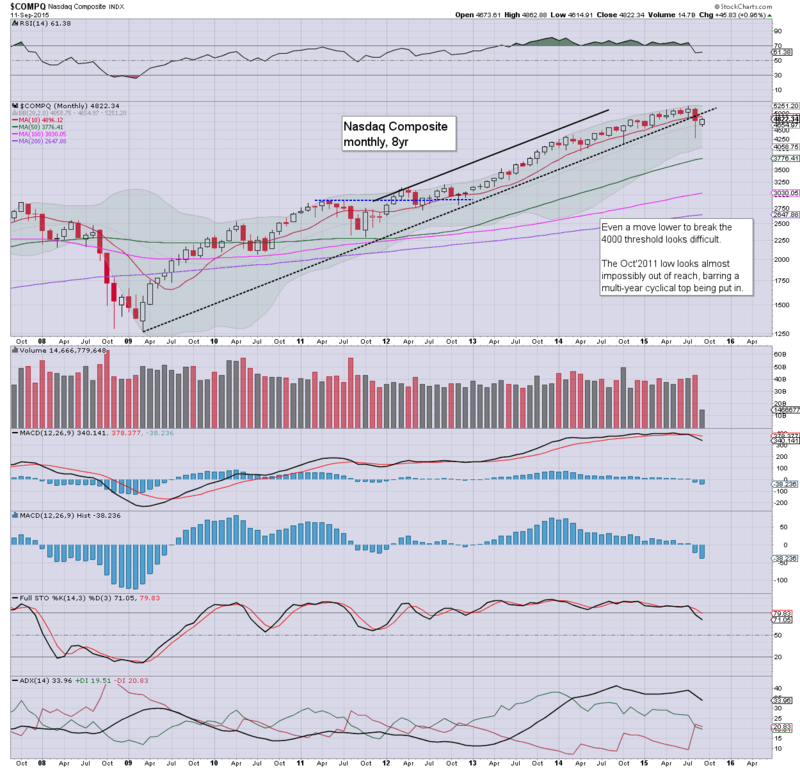 The Nasdaq is making a play to re-take the giant 5000 threshold. 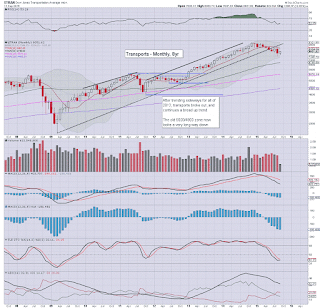 All things considered, a monthly close >5K looks unlikely. First key resistance is the 10MA @ 4896, which is only 1.5% higher. 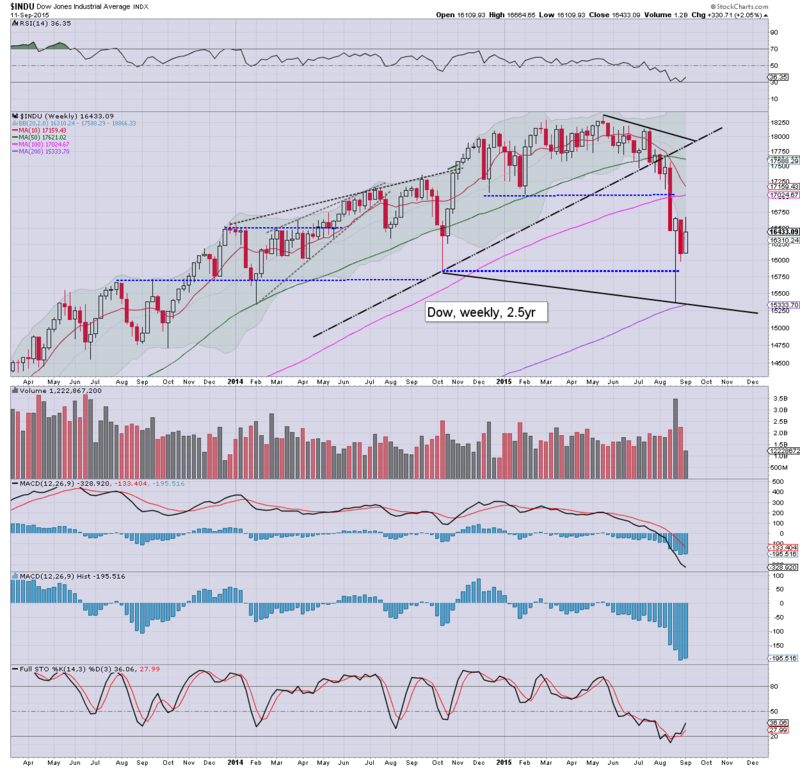 Primary downside for Oct' will be the 4100/4000 zone. 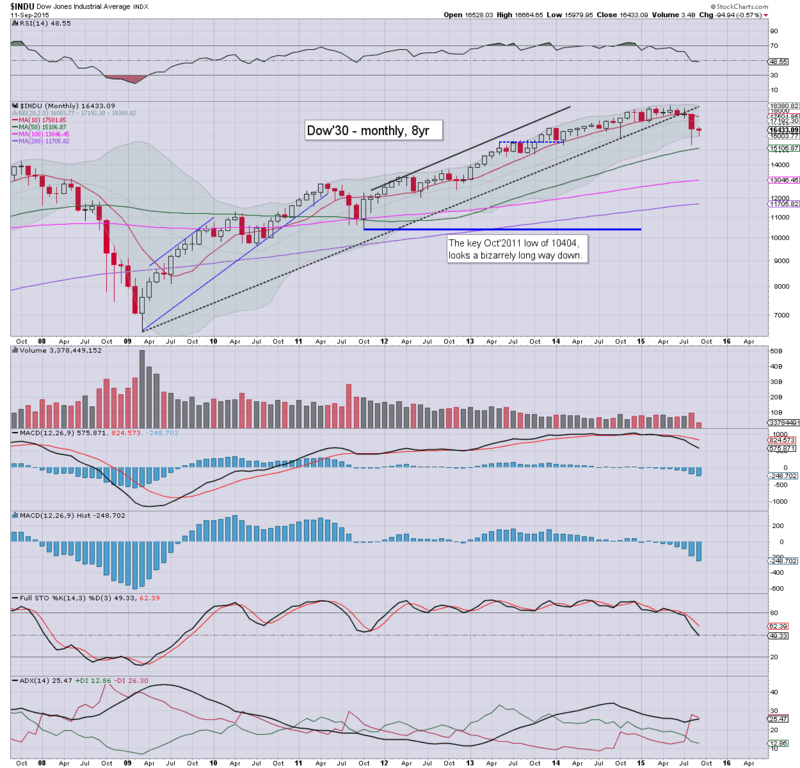 The Dow is a particularly broken index, having not only hit the lower monthly bollinger in August, but decisively breaking under it, to a short term low of 15370. 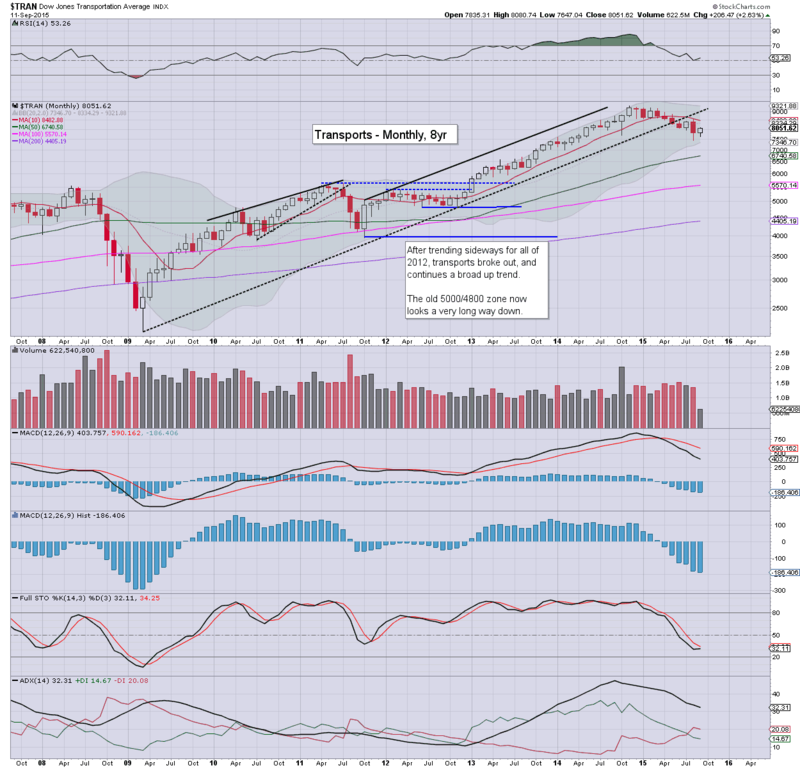 First upside resistance is the 17k threshold, with the key 10MA @ 17501. 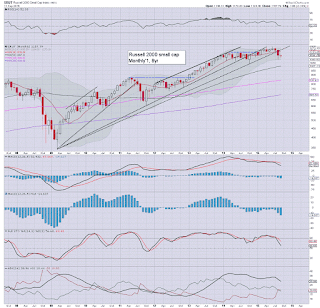 The master index hit a low of 9509 in August, and is already back above the big 10k threshold. First upside resistance are the 10500/700s. If the market is hit hard in Oct', downside target will be the 9000/8700 zone. The second market leader - the R2K, hit 1102 in August, and is well on the way to testing natural resistance at the 1200 threshold.. some 3% higher. Like other indexes, there is a clear break of core trend from 2009, and the R2K will be vulnerable to testing the Oct'2014 of 1040 next month. Sustained trading <1000 looks unlikely. 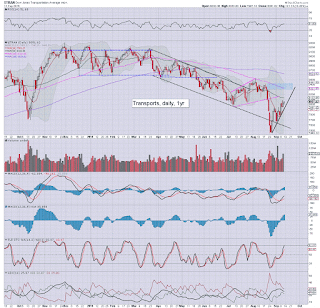 The 'old leader' - Trans, broke lower to 7452 in August.. well below the Oct' 2014 low of 7700. There is near term upside to around 8300s.. before renewed downside to 7000. 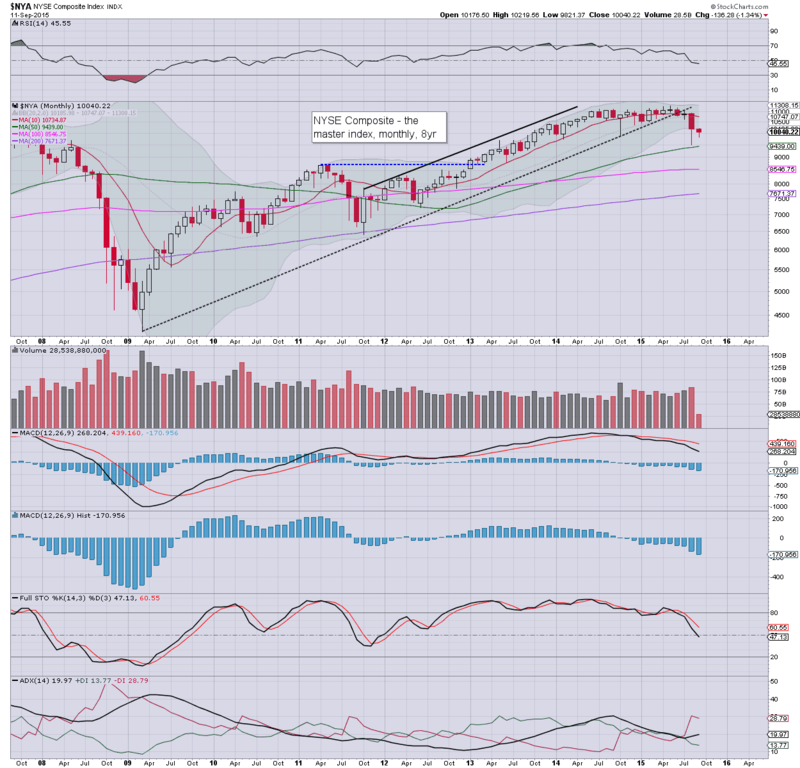 If correct, it'd likely equate to sp'1750/00 zone. 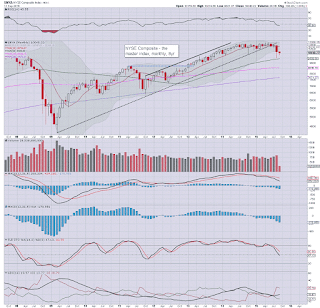 With the major August decline we have clear breaks of trend across all the main indexes. 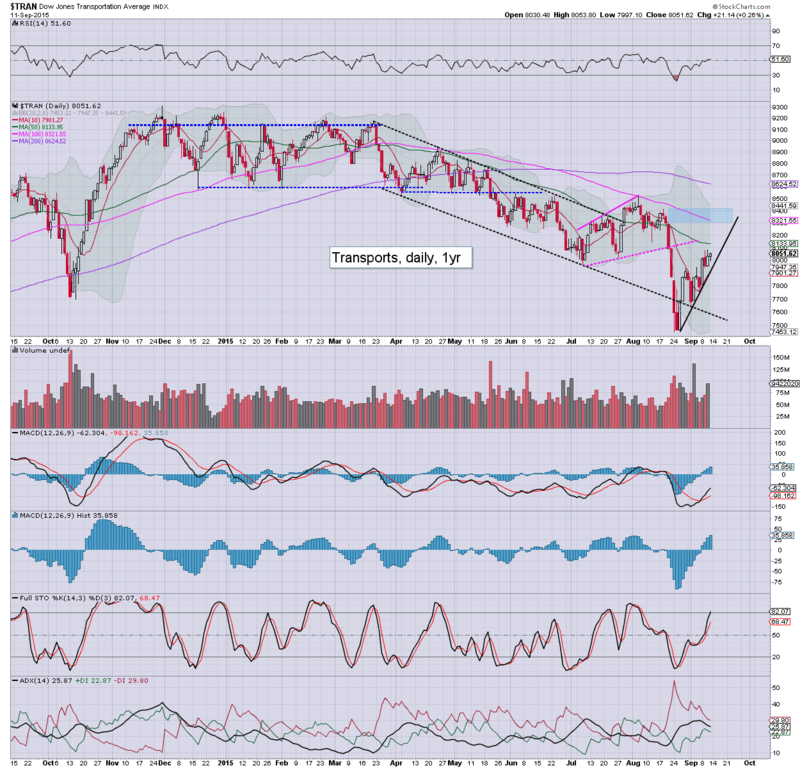 The Dow and Transports have already broken the Oct'2014 lows. I would imagine the other indexes have a very high probability of following next month. Renewed downside looks likely in Oct', back into the sp'1800s... perhaps the low 1700s if other world markets unravel... in particular, China. 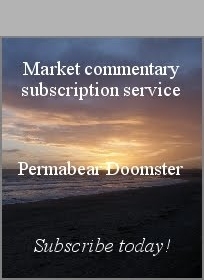 Without question, the market will be almost entirely focused on the FOMC next week. FOMC - announcement @ 2pm. There will be a Yellen press' conf' around 2.30pm, and that will likely last an hour. I remain in 'trading light' mode, and have ZERO interest in being short ahead of the Fed. Indeed, I would not be surprised if the market sees a spike of at least 1% in the FOMC-Thursday 2pm hour.. maybe even double that. 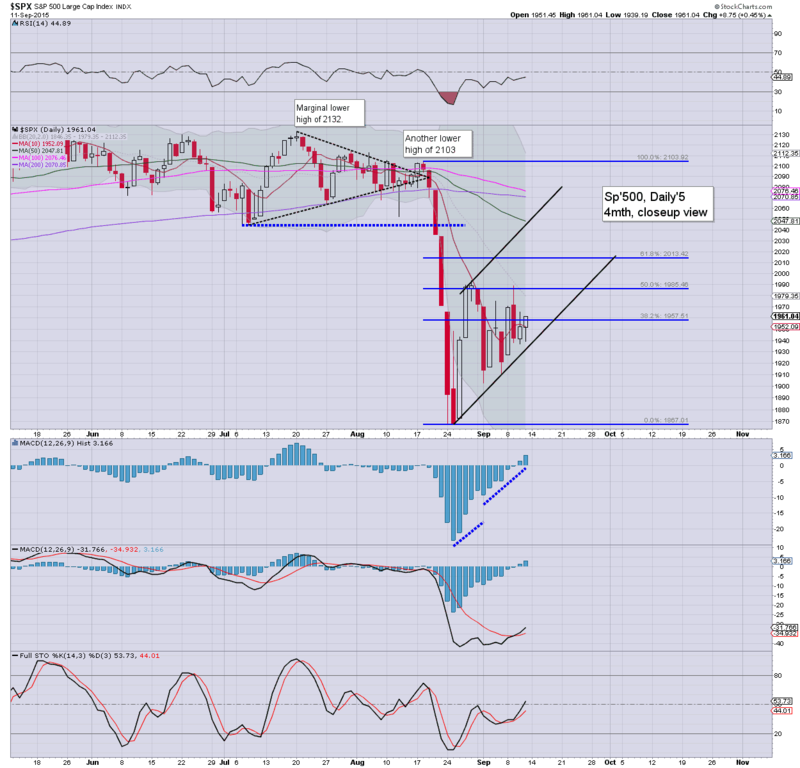 Once we do get past the FOMC, the market should level out, and start to break lower. I will look to start building short positions in anticipation of the sp'1800s by mid October. For those with some patience.. and a good plan (with trading stops), there are likely huge opportunities from now, all the way into year end. 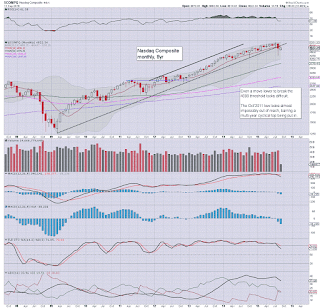 US equities saw significant net weekly gains, with the sp'500 +39pts (2.1%) @ 1961 (range 1927/88). 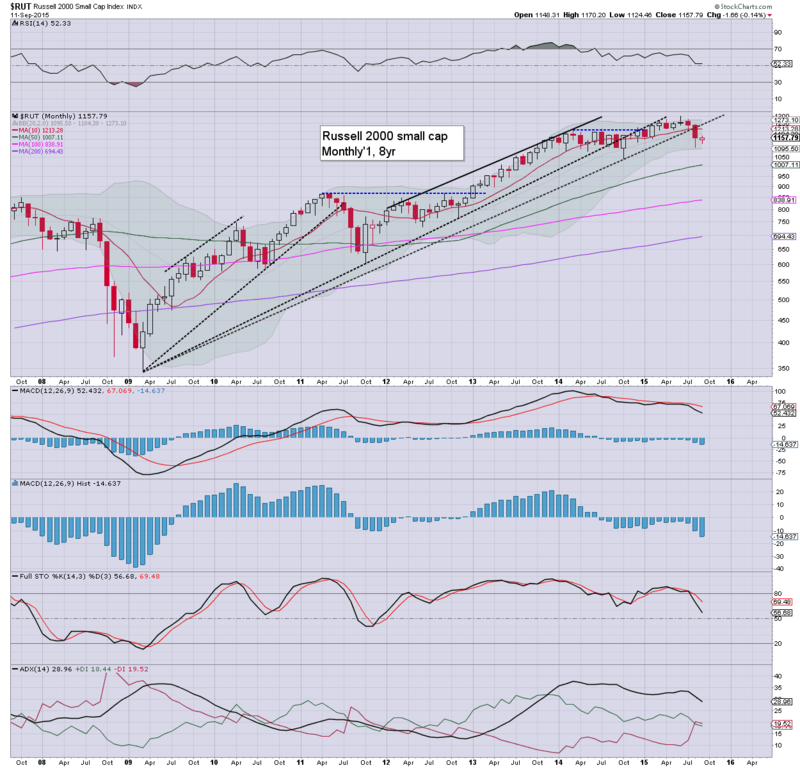 Near term outlook is for further upside to the sp'2000/2010 zone. However, the market might see a brief hysteria spike to the 2050/70 zone.. before the next big rollover. 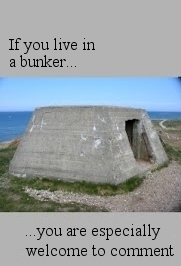 ... its been a long week... and I'll leave it that. US equities settled moderately higher, sp +8pts @ 1961 (intra low 1939). The two leaders - Trans/R2K, settled higher by 0.3% and 0.4% respectively. Near term outlook is for continued upside into the FOMC, at least to the sp'2000/2010 zone, however there is risk of 2050/70.. before the next big rollover. 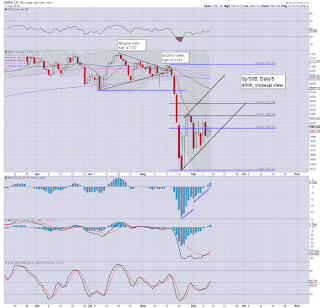 The market continues to battle upward (if very choppy) from the double floor of sp'1867. 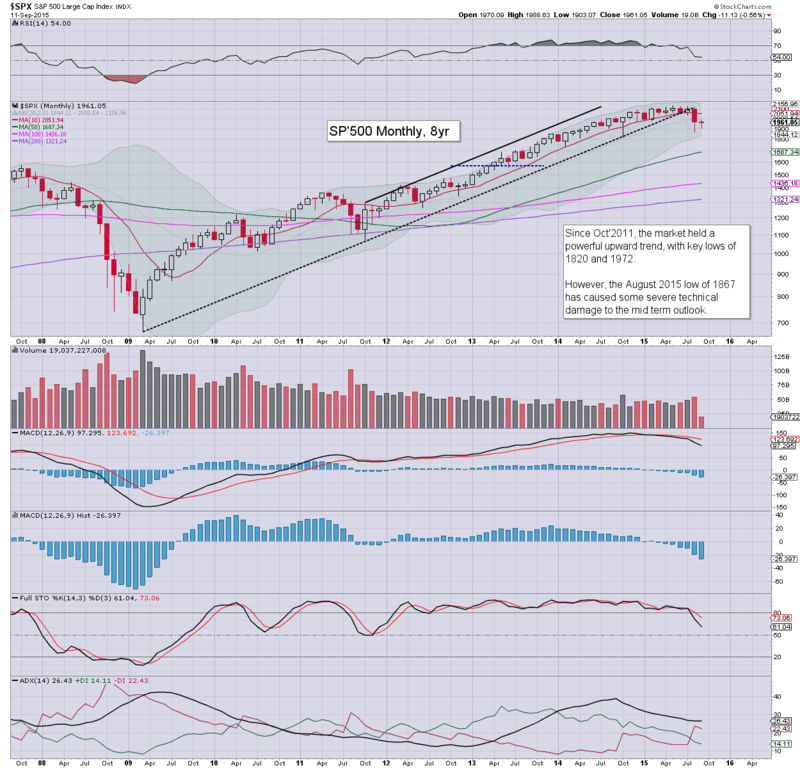 The sp'2000s seem a very viable target next week. Renewed downside is probable once the FOMC is out of the way... regardless of whatever they decide.